CompHobby!org everything I know is borrowed... A Sweet Ride So Far – ComphHobby! Where I live is basically bicycle unfriendly the roads generally are fair at best and motorists really don’t seem to know how to regard cyclists. Bicycle lanes are sparse and residents seem to think they are for parking or a good place to throw trash, glass, paper, cigarette butts, or to be used as extra road shoulder as needed. Some of us do ride despite the risks and to be honest I will admit some areas of town are better than others. We have a major university (LSU) here and there are a number of bike paths in that area in bad need of an update/repair so most cyclists around the campus use the streets or sidewalks, but motorists around there seem a little more aware of cyclists usually. So when I ride I look at it like this: one has to be tenacious or one will never get anywhere. One also has to be very defensive or one will get run over. It is always a good idea to go in pairs, trios, quads, or even larger groups to increase visibility and have a witness if anything happens. It is important to plan as some roads and streets are just plain dangerous and should be avoided if at all possible. Night time is less traffic generally but having at least be seen lights is a very good idea in fact the more light the better between the roads and the drivers one can’t be too cautious at night. Myself I tend to do a portion of my riding after dark because I like the overall low traffic conditions that occur at night in a lot of neighborhoods. I am not saying that Baton Rouge is more or less dangerous than anywhere else but just that like many towns I’m sure that riding a bicycle to get around shouldn’t be approached with anything less than a serious attitude and reasonably well built and maintained bicycle. OK I guess I’m rambling so I’ll move on. Currently I ride one of four bikes depending on my mood. Pictured is my newest edition to the pack and what has turned out to be a really easy to ride round town and neighborhood fixed/freewheel cruiser. I tend to spend more time on the freewheel side of the hub as I find it more convenient in stop and go traffic laden situations. This particular model is called a Wabi Cycles ‘Classic’ and it is hard to imagine any fan of bicycles not enjoying this one as it is really well thought out. Like I do with all things I dressed this bike up the way I like it. Since this one has bottle bosses I added two insulated bottles from Hydro Flask one is a 40 ounce and the other is a 21 ounce. 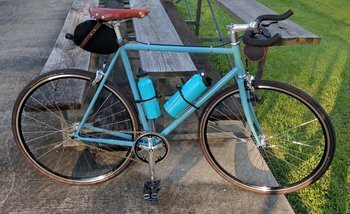 I am using bottle cages from Velo Orange. These cages do leave a line on the bottles where the wires go around but I am really not that concerned about keeping everything perfectly pristine looking. I bought this stuff to use after all. I have come to prefer leather saddles and the one I mounted here is a model from Rivet Cycle Works. I use Obenauf’s Leather Preservative to waterproof and preserve it. The folks at Rivet Cycle Works include a small container of the stuff with this saddle but I have been using Obenauf’s on two other saddles prior to giving the Rivet saddle a try and my experience with Obenauf’s has been very good. Obenauf’s will darken the saddle but so does every other leather treatment I’ve used. That is why I always start with lightest color available when I buy a saddle and have come to prefer the way the finish changes uniquely as the saddle sees more use. This one was some color called chestnut which appeared as an almost natural tone out of the box. I added two bags one saddle bag for tools and personal items like keys or wallet and a what I call a handlebar bag for my phone and some other small items. The bike rolls on 28mm Continental Gator Hardshell tires and is pushed by VP 001 pedals with Hold Fast FRS Pedal Straps. In as much as this bike is fairly new I can’t really give an in depth analysis but currently with just over 125 miles on it I am very impressed and find this bike very easy and comfortable to ride. It is light (18.4 lbs) and even with the things I added to it it comes in at shade over 24 lbs. I am not a weight freak but the “responsiveness” of the frame provides a really unique and enjoyable riding experience. As configured I can easily spend a day/night out fooling around town on this bike. ← What Direction Will CompHobby Go Now! Podcast wars: $100 million startup Luminary launches tomorrow without Reply All or The Daily The VergeThe subscription podcast startup Luminary launches on April 23rd with shows from Trevor Noah, Karamo Brown, Lena Dunham, Guy Raz, and other stars.